I hate it when something I look at on Amazon turns up in a Facebook ad. It doesn't help me, it creeps me. As part of my day job at Microsoft, I've begun to learn more about how advertising across the internet works on a technical level and it is quite interesting to learn how an image of a some head phones I looked at an e-commerce site ended up staring back at me from an ad on Facebook later that day. The fundamental technology that makes this possible is Facebook Exchange (FBX). 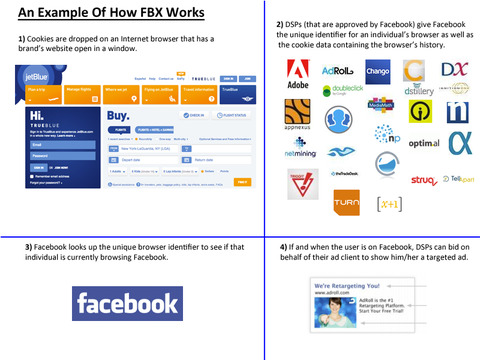 The infographic below provides an overview of how it enables ads from ecommerce sites to show up on Facebook and I’ll follow that up with a slightly more technical explanation. Facebook Exchange is a Real-Time Bidding platform which enables Facebook to sell ad slots on their page to the highest bidding advertisers in fractions of a second. Typically advertisers and publishers who own the pages where ads show up end up working together through an intermediary called a Demand Side Platform (DSP). A DSP such as AdRoll provides one of their retail partners such as American Apparel or Skull Candy with code to put tracking pixels on their site which allows the user to be identified and context such as what pages they’ve visited to be recorded. The retail partner then goes into AdRoll’s interface and decides how much they are willing to pay to show ads on various networks such as Facebook (via FBX) if a user who has visited one of their pages is shown an ad. AdRoll then provides data to Facebook that allows the user to be uniquely identified within Facebook’s network. Later when that same user goes to Facebook, Facebook puts out a request on its Ad Exchange saying “Here’s a user who you might be interested in, how much are you willing to pay to show them an ad?”, AdRoll then cross-references that user’s opaque identifier with the behavioral data they have (i.e. what pages they were looking at on an advertiser’s site) and if there is a match they make a bid which will also include their ad for the page that piqued their interest. If the retailer wins the auction, then their ad is chosen and either rendered in the news feed or on the right hand side on Facebook’s desktop website. Each of these pieces needs to happen in fractions of a second but is still slow enough that rendering ads tends to noticeably be the slowest part of rendering the webpage. In fact, there was a grand example of retargeting in action while I was researching this blog post. When I started writing this blog post I checked out AdRoll’s web page on how to use their service to retarget ads on Facebook. A few minutes later, this showed up in my news feed. You can tell if an ad is retargeted on Facebook by hovering with your mouse cursor on the top right of the ad (on the desktop website) and then selecting the options. If the “About This Ad” link takes you somewhere outside Facebook then it is a retargeted ad. Some ad providers like Quantcast provide an option to opt-out of retargeting for their service while others like AdRoll link to the Network Advertising Initiative (NAI) opt –out tool which provides an option to opt-out of retargeting for a variety of ad providers. Note that this doesn’t prevent you from getting ads and is instead just a signal to advertisers that you’d rather not have your ads personalized. If you found this blog post informative I've begun a regular series of blog posts intended to answer questions about online advertising on Microsoft properties such as Bing & MSN and on industry trends. Hit me up on Twitter with your questions. Has the notion of “files” outlived its usefulness?